By the way, An Heiress at Heart also includes a very romantic waltzing scene! People often think of the Victorians as stodgy and repressed. But in the early part of Victoria’s reign, a better description might be energetic, inquiring, and multi-talented. England was rising to a position of world prominence in trade, manufacturing, and colonization. Their industry and inventiveness was incredible. The worlds of science were opening up in ways never before imagined. The future seemed full of enormous promise. Imagine a giant building made of glass. It is the length of six football fields. Its roof is three stories high–a portion of it is arched to enclose 90-ft elm trees. When you walk inside, sunlight pours through the glass onto plants, statuary, and colorful banners. The building is filled with exhibitions of engineering marvels of all kinds, not to mention precious gems and other items from around the world. Such a place would be a marvel even today. The building I have just described was built in 1851. It was built in a matter of months with manual labor and real horsepower. The manufacture of plate glass was at that time a new technology. 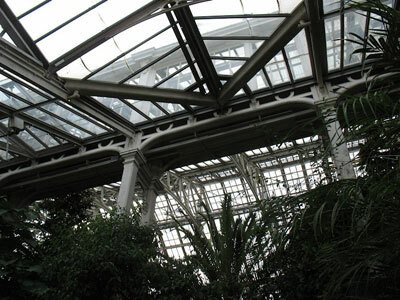 The photo on this blog page of the Glass House at Kew Gardens outside London gives just a tiny taste of what the Crystal Palace must have been like. This magnificent glass building, which soon become known as the Crystal Palace, was built expressly for The Great Exhibition of the Works of Industry of All Nations, now generally referred to as The Great Exhibition of 1851. Even today the exhibition is considered to be one of the high points for England in the 19th century. Prince Albert is often credited with coming up with the idea for this exhibition; this may not be completely true, but he was heavily involved in its planning and promotion and was vital to making it so successful. The Great Exhibition provides a background for An Heiress at Heart. I had a wonderful time researching this era to bring it to life in my books. I hope you will enjoy reading them as much as I loved writing them.